Telfairia occidentalis is a tropical vine grown in West Africa as a leaf vegetable and for its edible seeds. Common names for the plant include fluted gourd, fluted pumpkin. 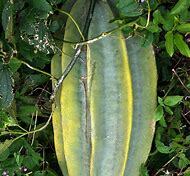 The fluted gourd grows in many nations of West Africa but is mainly cultivated in Igboland and Calabarland and it is used primarily in soups and herbal medicines. Although the fruit is inedible, the seeds produced by the gourd are high in protein and fat, and can, therefore, contribute to a well-balanced diet. The plant is a drought-tolerant, dioecious perennial that is usually grown trellised. Arugula /əˈruːɡulə/ or rocket is an edible annual plant in the family Brassicaceae used as a leaf vegetable for its fresh peppery flavor. Other common names include garden rocket and eruca. Eruca sativa, which is widely popular as a salad vegetable, is a species of Eruca native to the Mediterranean region. The golden samphire is a perennial coastal species, which may be found growing on a salt marsh or sea cliffs across western and southern Europe and the Mediterranean. Young leaves may be eaten raw or cooked as a leaf vegetable. Good-King-Henry has been grown as a vegetable in cottage gardens for hundreds of years, although this dual-purpose vegetable is now rarely grown and the species is more often considered a weed. 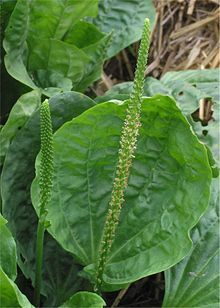 Plantago major (broadleaf plantain, white man's foot, or greater plantain) is a species of flowering plant in the plantain family Plantaginaceae. The plant is native to most of Europe and northern and central Asia but has widely naturalized elsewhere in the world. Plantago major is one of the most abundant and widely distributed medicinal crops in the world. A poultice of the leaves can be applied to wounds, stings, and sores in order to facilitate healing and prevent infection. The active chemical constituents are Aucubin (an anti-microbial agent), Allantoin (which stimulates cellular growth and tissue regeneration), and mucilage (which reduces pain and discomfort). Plantain has astringent properties, and a tea made from the leaves can be ingested to treat diarrhea and soothe raw internal membranes. Broadleaf plantain is also a highly nutritious leaf vegetable that is high in calcium and vitamins A, C, and K. The young, tender leaves can be eaten raw, and the older, stringier leaves can be boiled in stews and eaten. Gai Lan is the Cantonese name and Jie-lan is the Mandarin name for a vegetable that is also known as Chinese broccoli or Chinese kale. It is a leaf vegetable with thick, flat, glossy blue-green leaves with thick stems, and flower heads similar to but much smaller than broccoli. Its flavor is very similar to that of broccoli but slightly more bitter. It is also noticeably stronger. Kale or leaf cabbage are certain cultivars of cabbage grown for their edible leaves. 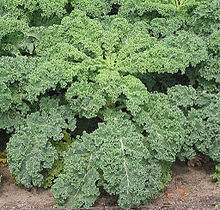 A kale plant has green or purple leaves and the central leaves do not form a head (as with headed cabbages). 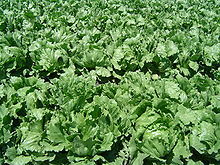 Kales are considered to be closer to wild cabbage than most domesticated forms of Brassica oleracea. 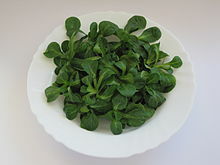 Komatsuna or Japanese mustard spinach is a leaf vegetable. It is a variety of Brassica rapa, the plant species that yields the turnip, mizuna, napa cabbage, and rapini. It is grown commercially in Japan and Taiwan. The name 'komatsuna' is from the Japanese komatsuna, 'greens of Komatsu', a reference to Komatsugawa village where it was heavily grown during the Edo period. It is stir-fried, pickled, boiled, and added to soups or used fresh in salads. It is an excellent source of calcium. Talinum fruticosum is a herbaceous perennial plant that is native to Mexico, the Caribbean, West Africa, Central America, and much of South America. Common names include Ceylon spinach, waterleaf, cariru, Gbure, Surinam purslane, Philippine spinach, Florida spinach, potherb fameflower, Lagos bologi, and sweetheart. It is widely grown in tropical regions as a leaf vegetable. Valerianella locusta is a small annual plant that is eaten as a leaf vegetable. 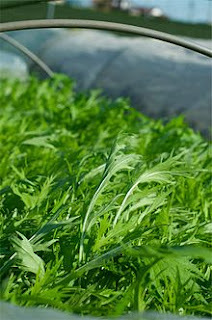 It has a characteristic nutty flavor, dark green color, and soft texture, and is popularly served as salad greens. Common names include corn salad, common corn salad, lamb's lettuce, mâche, fetticus, feldsalat, nut lettuce, field salad, and Rapunzel. It is typically served as a salad with chopped hard-boiled eggs and crumbled bacon. Land cress (Barbarea verna), also known as American cress, bank cress, black wood cress, Belle Isle cress, Bermuda cress, early yellow rocket, early wintercress, scurvy cress, creasy greens, and upland cress, is a biennial herb in the family Brassicaceae. It is native to southern Europe and western Asia and naturalized elsewhere. It has been cultivated as a leaf vegetable in England since the 17th century. As it requires less water than watercress, it is easier to cultivate. Lettuce (Lactuca sativa) is an annual plant of the daisy family, Asteraceae. It is most often grown as a leaf vegetable, but sometimes for its stem and seeds. Lettuce is most often used for salads, although it is also seen in other kinds of food, such as soups, sandwiches, and wraps; it can also be grilled. One variety, the woju, or asparagus lettuce (celtuce), is grown for its stems, which are eaten either raw or cooked. In addition to its main use as a leafy green, it has also gathered religious and medicinal significance over centuries of human consumption. Mizuna, "water greens", Japanese mustard greens, or spider mustard, is a cultivated crop plant from the species Brassica rapa var. niposinica a dark green, serrated leafed plant. The taste of 'mizuna' has been described as a "piquant, mildly peppery flavor...slightly spicy, but less so than arugula." It is also used in stir-fries, soups.